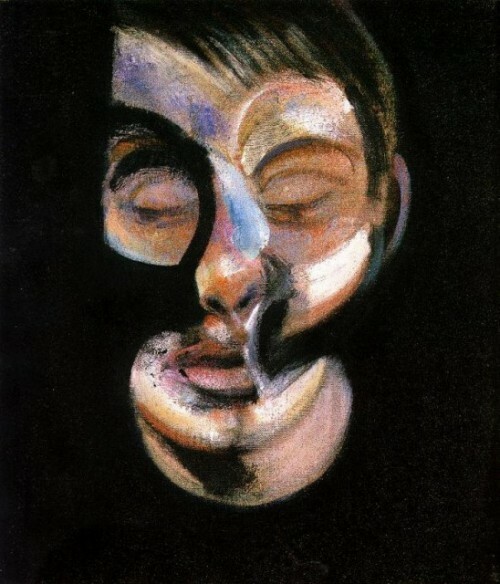 Francis Bacon, ‘Self Portrait’, 1972. Time passes in the usual ways. Trees lose their leaves, and then grow them back again. Snow piles high along the streets, white in the morning, black by evening, only to melt into the hungry mouths of fresh infant flowers blooming across the fields and parks and window sills. And still they stay there, waiting, and waiting, always more urgently. Soon their already heavy heads fall crooked to the side. They swing their bursting heads around their necks, thin as winter branches, their skulls, like fat apples ready to fall. A nod takes great effort and to look left then right exhausts them completely. Soon they crumple under the weight of their heads and become very crooked and small. They crawl across the floors now, dragging along their swollen thoughts; the effort so constant they begin to forget to wait. Until they forget so completely to wait that once it arrives they miss it all together; and so their swelling heads take up all the space. All the room of their rooms fills with giant eyes and ears and stretched vein crossed foreheads barely holding in all the beliefs and memories and constellations of observations. They soon grow tired of dragging around their heavy thoughts and wish to have no heads at all. They think of ways to free themselves from thought – and with each thought grow larger still and more crooked and crumpled still. They decide that all they can do is to wait for the time when they can let go all together. They begin to wait for the time to come, unsure of how they will know when it has arrived. They wait while they watch, as the trees begin to sleep. Lining the pristine streets, they wait, heavy with anticipation, swaying side to side under the weight of waiting.